2013, A Year Of Learning. The year 2013 is coming to an end. As it does I have been looking back and thinking about the past year. So much has happened in my life and in the lives of those around me. There have been good times, moments of joy, of silliness, of excitement, happiness, love and laughter. There have also been bad times, moments of heartache, of loss, of sadness, hardships, sorrow and pain. We can hold on to the memories of the good, we can learn from the memories of the bad, and we can hold on to the bonds we have built with each other. When you experience life with people, it links you to them, it binds you together. To me, family isn’t determined by blood, it is determined by love. I have chosen the friends in my life, and they have chosen me. Again, everything comes down to choice, and this mutual choosing is what I think makes a family. There are so many people in my life, and they all have a reason to be a part of it. Each and every person brings something important with them. Some are more serious and help me see the facts. Some are sarcastic and help me see different views. Some are silly and help keep laughter in my life. Some are caring and help me to care for others. Some are even negative, and they all help me keep a wide variety of views on life. Together all of these people help make me who I am. Everyone is in your life for a reason. Even those that are no longer in your life. I have lost loved ones, I have lost friends, I have lost people that shouldn’t be in my life anymore. All of these people have taught me lessons. Losing my mother was the hardest thing I have ever been through, but it taught me strength, it helped to motivate me to improve my health, it taught me to appreciate the loved ones I still have, and form tighter bonds with those around me. Losing friends was also hard, but it taught me a lot about who I am as a person, what I want out of life, and again to appreciate those still around me. Losing the people that shouldn’t be in my life was actually a result of those lessons. I have the strength and the knowledge to know what I want and what I need. I now know a bad situation when I see it, and I am strong enough to remove myself from that situation, no matter how much it hurts the heart, or how much I hate hurting others. Sometimes it is simply for the best. Sometimes it takes a lot of tragedies and negative things to really help us appreciate the world around us. It can be easy to look at the previous year and focus on the bad and say it was a horrible year. As I’ve said in previous posts, I think all these things happen for a purpose and we can learn from them all. So, instead of writing 2013 off as a horrible year, I am declaring it a year of learning. I have learned so much about myself. I have analyzed the things that have happened and milked them for all of the lessons they can teach me. Doing this has made me stronger. My perception has changed so much, and I have grown and improved as a person. I am not taking anything or anyone for granted anymore. I have redefined what family means to me. Simply put, because of everything that has happened, I am happy. I believe that something good can come out of every single situation. No matter how depressing, devastating, scary, scarring, painful, or horrific the situation, something good can be taken out of it. It may take some extremely deep thinking, it may take years, and it may mean admitting something we do not want to admit. Take something from your own personal life, something that you think could never have a benefit, or an iota of good to it. Examine what happened, how you felt, what happened afterwards. Did you learn a lesson? Did you learn something about yourself you never knew? Did you learn something about someone else? Did it help build you stronger? Did it bring people closer? Really examine every possible aspect. I will use an example from my own life to show what I mean. Three years ago my mother died. At age 25 I lost my mother who was only 55. She was my best friend. She was my rock, my support system, my inspiration, my entire world. After she died, my entire universe crumbled. It has taken me three long years to realize that even losing my mom, my best friend, did indeed cause some good. Losing her caused me to wake up. She was sick for a very long time, and while she was alive I built a mental wall around myself. I felt I had to be strong, had to be responsible, and frankly, I didn’t want to deal with emotions. So, when she passed away, while my universe was falling apart, so was that wall. I faced demons I had hidden away for a very long time, my heart opened up and I could feel. Good god could I feel. Pain, happiness, sorrow, and joy all came rushing in. I admit I went a little..lets say crazy for awhile. Once the aftermath settled down though, I did not put that wall back up. I was stronger, and I felt a change inside me, a change for the better. Also, to my great surprise, I became closer to my immediate family. Besides my mother, I was never really emotionally close to my father, nor my sister. This tragedy bonded us, we became close, we were there for each other. After losing her, and still to this day, I feel closer to them than I have ever felt before. It is a good thing. Yes, I wish these things could have happened without losing her, but I am so very grateful that I was able to learn these things. 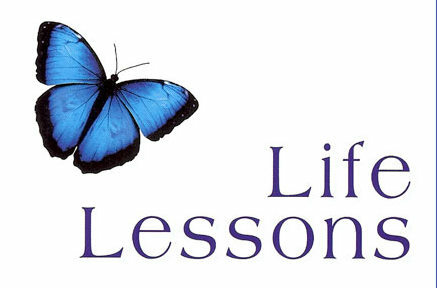 Sometimes life lessons and lessons about ourselves can only come because of tragedy. It is a sad fact, but still, I think it is a valid one. Pain can give us the opportunity to examine things in ourselves, our life, our point of view. It is up to us to take advantage of these moments. We can choose to either ignore them, focus on the pain, the tragedy, close ourselves off, or we can choose to be strong, work through them, and take what we can from them.